1. LJC contributor – Jeffrey‘s storage bins. I love this! A record store-simulation without having to leave home! And no price tickets Great! The woodwork designs can be found at AudioKarma if there are any carpenters out there. Jeffrey tells me the inspiration for the design is no longer having to squint to read record spines – you can simply flip covers, as nature intended. Grrreat! Now this is seriously cool. Bulk storage has room to breathe – space for more records, and a near-turntable storage area for current listening. Oh and a few random boxes of overflow that haven’t made it to either area. Sound familiar? Great stuff. Thanks Tim. Perfect solution, Phil integrates his “small” vinyl collection into a domestic setting, as a living room sideboard, in white.And great covers on display in front of the less attractive record spines. 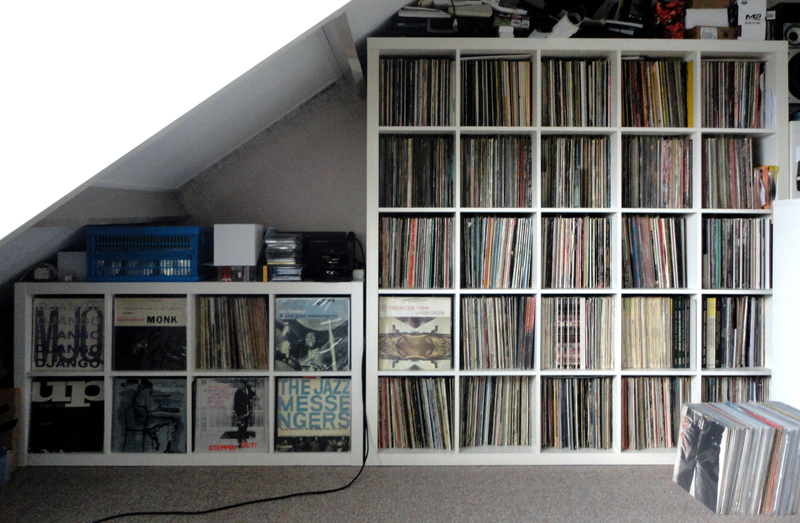 For some of us, records are banished to the “man cave”. Nice one, Phil. 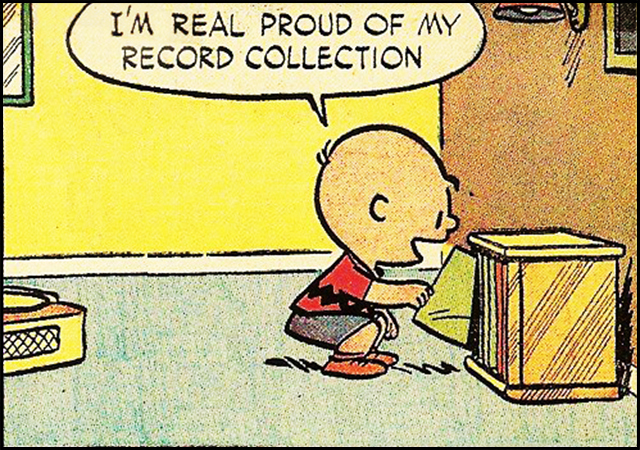 We also see Phil Jr. being inducted into to the fine art of crate digging. Get ’em while they are young. 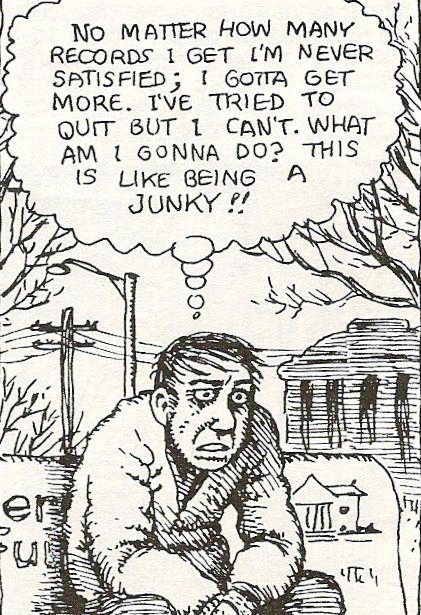 Later, you could may be introduce junior to the finer points of mono and stereo recordings…that is “real” stereo as opposed to…oh never mind. Shades of Redd, and another fan of Expedit for displaying covers. Neat! I like the saxophone as objet trouvé. Apparently this is just the vinyl section. As much space again is available for the Evil Silver Disc opposite. Great! Thanks Matty. I just love seeing shelves of vinyl. 7. 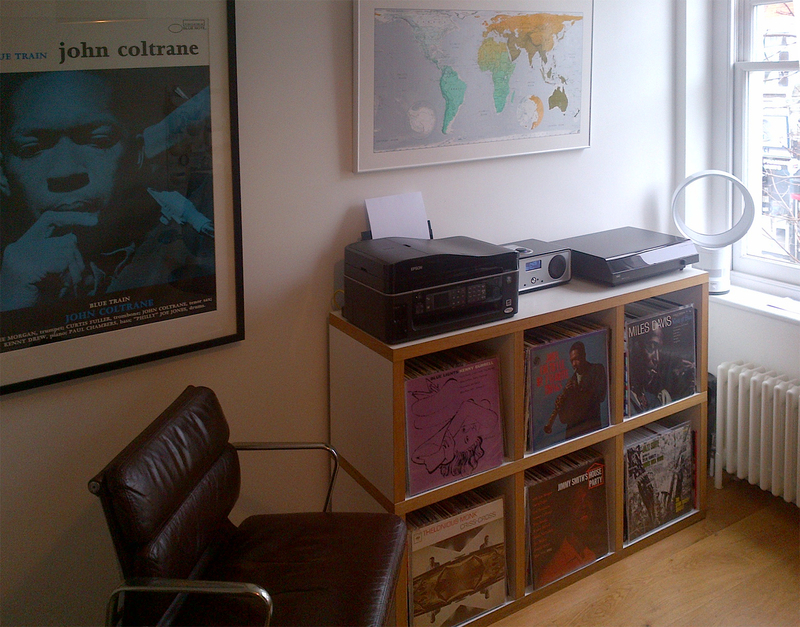 LJC contribution: John has sent in this photo of his cool urban setting for some choice records. The Blue Train poster sets the cool tone and I see a Dyson on hand to make sure things stay cool. Umm…cool, John, and nice to see the flag waving with Stan Tracey down there on the bottom right. 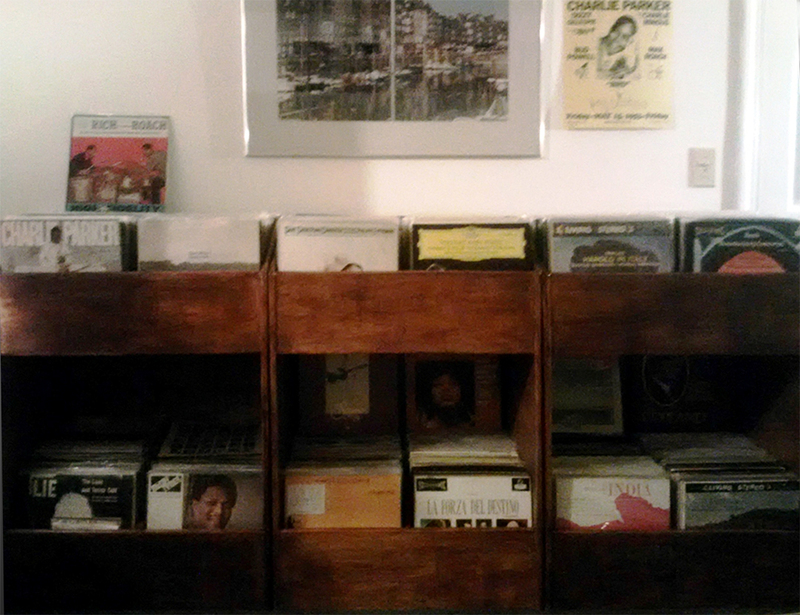 Just room for a few more records before every collectors dilema kicks in: where oh where to put the second Expedit? Plenty more space if you want to put your collection on Dr LJC’s couch. I was enthralled by pictures of these immense record collections! Large collections such as these, selected and lovingly “built” by individuals who are knowledgeable music curators, become a deep source for listening enjoyment, and a “go-to” reference source for an individual’s learning for passion’s sake towards the music. 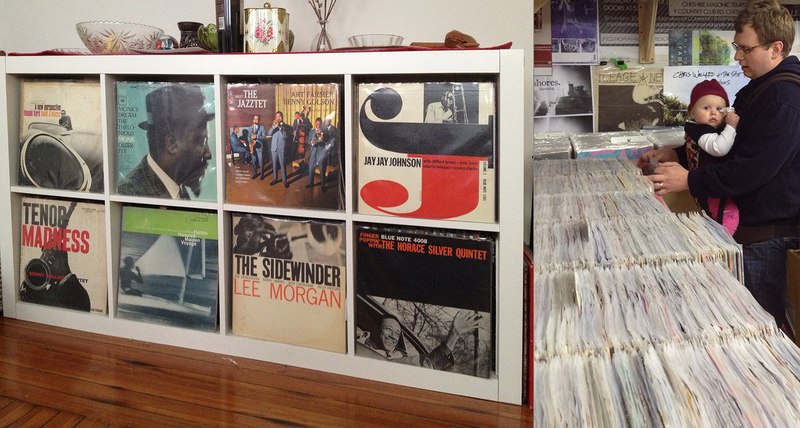 My former collection (sold almost three years ago to pay bills – large auto bill plus rent payments due) was about eleven hundred records (yes, I know – small as large collections go) of which between eight and nine hundred were jazz. The remainder was rock from the late 1960s and smaller sections for folk, blues, classical, and spoken word. I also had between 760 and 800 CD’s most of which were jazz. It was gratifying to be able to pull half a dozen or more records/ CD’s off the shelf, and listen to different renditions of standards by small groups, singers, piano trios, etc. Or, to trace one artist’s playing and writing through several sessions for Blue Note over the years. You can never become bored with or “use up” a large record/ CD collection. This collection is one’s own in depth music library. It’s breadth means there is always something to listen to and enjoy, or learn from. That wouldn’t be from a “Zap” comic, would it?